A plaza in downtown Tulsa has gained recent notoriety as the hiding place for modern art. From street level the corner of 4th Street and Main looks like your typical abandoned gathering place. First Place Tower looms over the concrete planters and vacant benches. But it's the lower level that hides the treasure. Under the plaza stands a bronze-colored fountain. There is no water. Just an abstract sculpture, the work of world renowned modernist, Harry Bertoia. The fountain originally stood in the entrance of the First National Autobank (aka The Vault). Patrons complained about the water spray, and the fountain was eventually moved. Or... more accurately: hidden. There are rumors the Bertoia may someday be moved from its subterranean hidey-hole. Hopefully it could be relocated to a place where an operational fountain would be appreciated. We'll see. But this is not the first time modern art has "hidden" here. For years I have searched for the story behind another modern sculpture. This one also stood near First Place Tower. Street-level this time. I was reminded of it while perusing a collection of slides from the Murray Jones Murray collection. The firm designed the white tower and adjacent plaza complex in 1973. Here's a view looking northeast from Main showing the plaza and Tower. On the far left of the photo you can see a black shape behind a light pole. That's the mystery sphere in question. It resided on a grassy spot just north of the First Place Tower, behind the Home Federal Savings & Loan building (map). Photo from the Murray Jones Murray archive, courtesy Tulsa Foundation for Architecture. First Place Tower at 15 W 5th Street is Tulsa's third tallest building and is connected to the First National Bank and Home Federal Savings buildings. The plaza area is built over an underground auditorium and tunnels that connect the complex to a parking garage on Boulder. In the Eighties an update left its indelible Chrome-and-Granite mark on the facade. But let's get back to the mysterious orb! The object was a black sphere segmented into geometric slices. Jackie said it always reminded her of the B-movie classic, Phantasm. 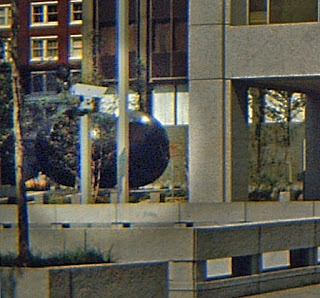 Unlike the movie, this orb was black, appeared to be made of fiberglass and stood about 10 to 12 feet tall. There are rumors it may have been created by the Japanese-American sculptor, Isama Noguchi. Here's a closer look. The black ball just vanished sometime in the Eighties or Nineties. Then a fountain turns up. But no one notices. There is a certain irony here. Maybe this area is a Devil's Triangle? But for modern art? Or possibly it's more like an island of lost toys? Maybe it flew away like the chrome ball in Phantasm? But most importantly, what happened to the mystery orb? Where is it now? Why did it disappear? If you have any photos or information on the mystery orb post a comment below or share them on our Facebook page.